Use the top movers report, on the dimensions tab, to help explain performance changes, or as a way to regularly monitor your account. 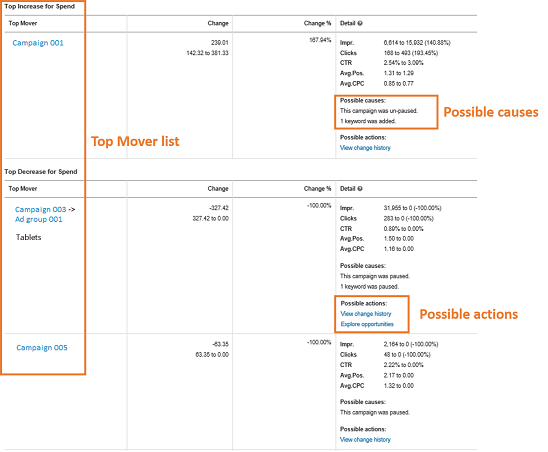 Use the top movers report to help explain performance changes, or as a way to regularly monitor your account. It identifies the campaigns and ad groups responsible for the biggest changes (both increases and decreases) in clicks, spend, and conversions during a specified time period, and provide possible causes of the change and suggested actions. Go to the Campaigns page, in the All campaigns view. On the Show menu, click Top movers. In the drop-down menu, select the number of days that you want to compare: 7, 14, or 28 days. Choose a Comparison ending date up to 90 days in the past. How it works: If you choose a duration of 7 days and a comparison ending date of January 30, the top movers report will show data for January 24-30. It will compare this date range against the date range immediately prior to it, equal in length of time. In this example, data for January 17-23 would compare against January 24-30. Top increases show the total positive change in spend, clicks, and conversions for your top mover campaigns and ad groups during the selected time period. Top decreases show the total negative change in spend, clicks, and conversions for your top mover campaigns and ad groups during the selected time period. Other changes are the changes in your ad group and campaign data that aren't significant enough to be considered top movers. Total change is top increases + top decreases + other changes, which equals your account's overall change in spend and clicks. The totals for each time period are shown below the change metrics. In the summary table, click Spend, Clicks or Conversions to see the list of top movers in the table below. Each row shows one top mover. Depending on what you click, the details column shows key statistics, such as impressions, clicks, CTR, average position, average CPC, spend, conversions, CPA, or conversation rate. A top mover can be a campaign or ad group and you can find the name in the Top mover column. If a device or network contributed significantly to the performance change, the top mover will show the device or network segment in the Top mover column. The numbers reported in the Change and Details columns are for this segment only. You’ll also see possible actions for you to take, providing easy access to the change history report and to exploring opportunities to increase clicks and spend.